This past weekend was a busy one at the Parker house. We had been contemplating adding a new puppy to the family after we lost our 16-year-old dog Daisy, and I finally called the same breeder in Madison, Georgia where we found Janie three years ago. The breeder said that she did have two girls ready to go to the perfect home. Pictures and phone calls were exchanged for a few days—and then we decided to Drive to Madison and have a look at the sweet Tri-color King Charles Spaniel. Our college son was home for a visit to Cashiers and came along to see the new pup. We loved cutie-pie Gracie as soon as we saw her! I knew the decision was made when she immediately ran to greet me at the door—the dogs always pick you out, even if you think you are picking them out. College son loved the Blenheim pup, too, as she resembled sweet Daisy, his dog. 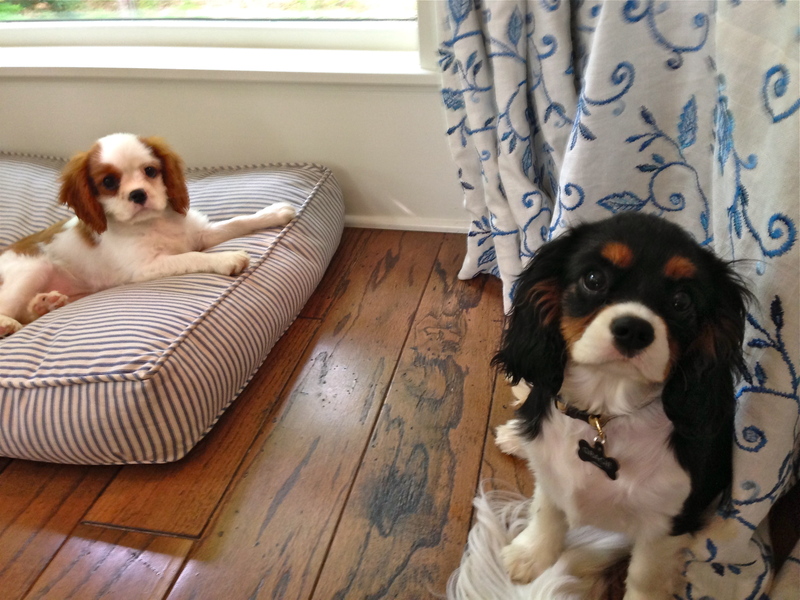 Well, you guessed it—we now have two new puppies at the Parker house. Take a look at these little sweeties. How could we resist? Your new puppies are adorable! 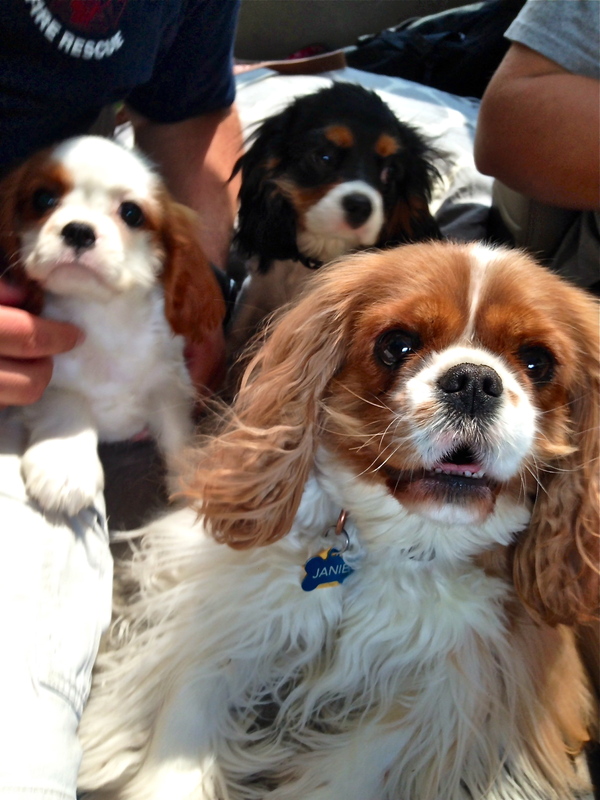 I’m certain there’s no sweeter breed on the planet than Cavaliers . . . We have two–but there are eight total in my family. 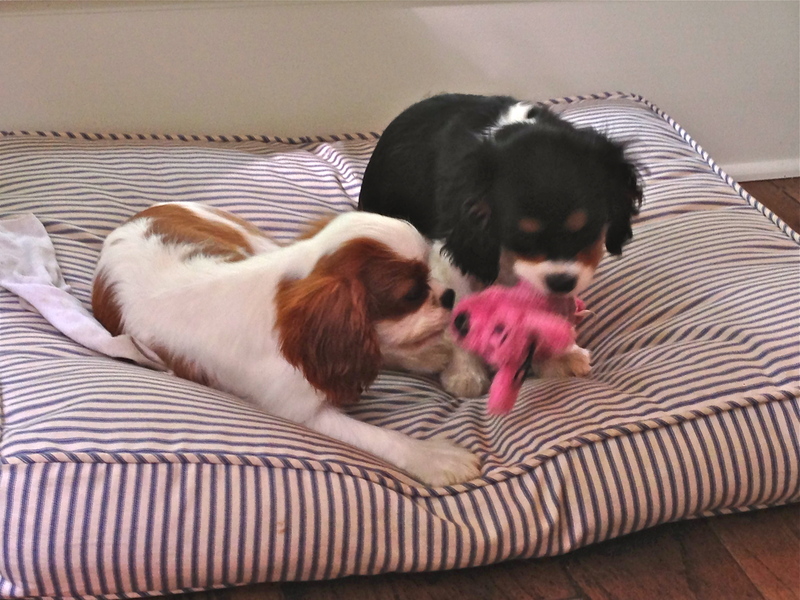 Enjoy your sweet new babies–am sure Janie will show them the ropes! Thanks Amanda! They are little cutie pies. Every day is an adventure with these two. Janie is teaching them all of the tricks. Happy times ahead with them. Lynn, They are the cutest puppies ever—in my opinion. Gracie is sweet and calm—Lilly is crazy and goofy. Oh sweet puppies, we recently lost our beloved golden retriever and this post makes me want a new little thing to love. I am a a new fan of your blog, having somehow found you, not sure how. My husband and I just purchased a small ranch home in Highlands and you are providing so much fun inspiration and information of the lifestyle there. Thank you!!!! Cindy, Love your blog too! I love exploring this little piece of heaven in N.C..
My mother has had two cavaliers and just loves them! They are adorable Lissy!! Could they possibly be any cuter – those faces…love!